The Browne 5724176 Thermalloy® roast pan is ideal for cooking and serving large slabs of meat in customer facing applications. 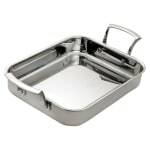 This pan can be used on ceramic, electric, gas halogen, and induction cook tops. Two handles on each side are built to be gripped by hands for lifting and serving. The stainless steel construction is heavy duty for constant use and easy to clean. The Browne 5724176 Thermalloy roast pan is part of the Try-Ply series that has an aluminum layer that evenly distributes heat for hot and cold spot elimination.